Mr Narayan paid homage to the founder, Fiji-born Hamid Ali, who resides in United Kingdom and to their staff members. 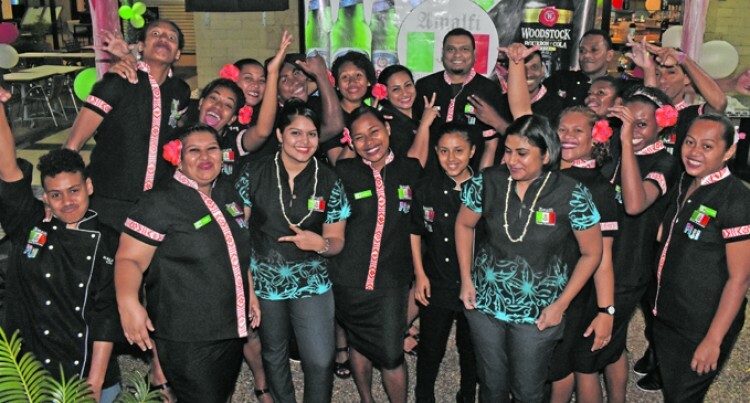 The Port Denarau based Amalfi Italian Restaurant last Wednesday celebrated its 10th year anniversary. Its staff members gathered together to cut the cake with its regular customers to celebrate the achievement. Restaurant manager/executive chef Salend Narayan has been part of the establishment for the last eight years. Mr Narayan paid homage to the founder, Fiji-born Hamid Ali, who resides in United Kingdom and to the restaurant’s staff members. Mr Ali’s other businesses includes the Crow’s Nest Resort Fiji on the Coral Coast. Mr Narayan said: “Since the beginning, Amalfi, the only original, true, authentic Italian restaurant in Fiji, ensures a constant delivery of Italian taste through its extensive menu composed of a huge variety of dishes. “Using a perfect combination of imported ingredients and fresh local products, it is possible to visit Italy without moving from the wonderful location of Denarau Marina by the sea. He said the restaurant will undergo renovations soon. Mr Narayan also acknowledged Tappoo’s for importing some of the best beverages including the Italian beers such as Peroni and many more. Assistant manager/Sous chef Ronald Kumar, who has been part of the restaurant for the last nine years said: “It has been a successful story and located in the most ever growing area of Port Denarau. Luisa Vuninai who has been employed going into her 9th year said, the establishment has been like her second home.